Last week, a federal jury in Texas imposed a nearly $93 million penalty against Allied Home Mortgage Capital Corp. and Allied Home Mortgage Corp. (now known as AllQuest Home Mortgage Corp.) and CEO Jim Hodge for issuing thousands of bad loans and leaving the Office of Housing and Urban Development (HUD) on the hook for $834 million in failed mortgages during the recent housing crisis. Under the False Claims Act, that penalty is subject to mandatory tripling – for a total of $270 million. This is only the second case against lenders related to the housing crisis to go to trial. Most others have settled outside of court to avoid having their penalties tripled. The case was filed on November 1, 2011, the same day HUD suspended Allied Home Mortgage and it’s CEO from doing business with it. 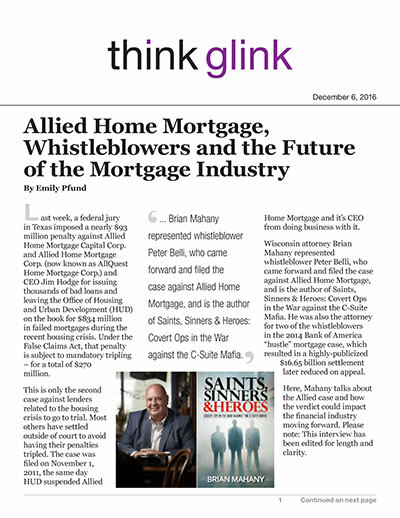 Wisconsin attorney Brian Mahany represented whistleblower Peter Belli, who came forward and filed the case against Allied Home Mortgage, and is the author of Saints, Sinners & Heroes: Covert Ops in the War against the C-Suite Mafia. He was also the attorney for two of the whistleblowers in the 2014 Bank of America “hustle” mortgage case, which resulted in a highly-publicized $16.65 billion settlement later reduced on appeal. Here, Mahany talks about the Allied case and how the verdict could impact the financial industry moving forward. Please note: This interview has been edited for length and clarity. What is the False Claims Act? How do these cases work? The False Claims Act was passed when Abraham Lincoln was president during the Civil War. The government was broke – a lot like it is now – and vendors were selling the Union Army wool blankets with holes in them and wagons with wheels that kept falling off. The Justice Department didn’t have the personnel to pursue the offenders, so the False Claims Act was passed to allow citizens to file a lawsuit on behalf of the government. The government gets the first crack at investigating the case and can take over the case or tell the whistleblower to prosecute it privately. There are about 600 of these cases each year filed under the federal law, but some states also have false claims laws. Who was the whistleblower in this case? What were his allegations against Allied Home Mortgage? In this case, our client (Belli) was a branch manager and had lots of inside information. He was first employed by Allied in 1998 and he was a very successful branch manager. He built branches in Massachusetts, Rhode Island, Missouri, West Virginia and Arizona – and was one of their largest producers in the company. HUD passed a regulation in 2000 that said lenders – banks or nonbank lenders like Allied – had to have skin in the game, that they had to own and operate the branches. What they didn’t want was lenders franchising and letting anyone open a branch. HUD feared quality would go down and there would be more opportunities to cut corners. Allied had some branches that were completely following the law, doing everything they were supposed to do. But there were other branches that went rogue, just trying to write as many loans as they could to make the commissions. Many were shadow branches that HUD didn’t even know existed. [It came out in the case that] Jim Hodge, the CEO of Allied, allowed almost anyone to open an Allied branch with very little money in the deal or oversight. Those branches were writing loans with forged documents and tax returns. If you wanted to buy a house but you had bad credit, you could go to a shadow branch under the Allied banner and get a mortgage. Things got so bad that, according to HUD, in 2006 and 2007 nearly 55 percent of the loans out of Allied were bad and going into default. How were consumers impacted by these practices? I think a lot of them were paying for loans they never, ever, ever could afford. The sad fact is that thousands of homeowners that had relied on Allied for mortgages lost their homes. At one point, they were the fifth-largest FHA lender. When the loans defaulted, HUD – you and I, the taxpayers – paid out $834 million. People lose their jobs, have health problems or die prematurely and can’t pay their mortgages, so the government expects a certain rate of default, but (nearly) 55 percent was just off the charts. It was the highest of any major lender at the time. What does this case mean for the mortgage industry moving forward? I think in the short term, most of the mortgage companies have at least tried to clean up their acts (since the housing crisis). Unfortunately, I think this [the fine] is a cost of doing business for most of them. Bank of America, Wells Fargo and these other lenders have been hit with so many regulatory violations and the CEOs keep saying they’re really sorry, but six months later you’ll read about another multimillion- or multibillion-dollar case. One important thing is that in this case, the Justice Department went after the CEO and he’s now personally on the hook for $22 million [Editor’s note: the jury imposed a $7.4 million penalty against Hodge, which will be tripled under the FCA]. This will start to get the attention of banks and mortgage companies. That’s no longer just a cost of doing business. I think that is going to have more impact than huge fines. Those look great in the press – for the average American, multimillion- or multibillion-dollar numbers are hard to fathom – but for a $1- or $2 trillion bank, it’s not that much. If you go after the CEO and his or her wallet, that will get their attention.